Someone once asked Nancy, “Why do you cut perfectly good fabric into pieces just to sew it back together again?” Her answer, “To create great quilt designs!” One of the designers that Nancy had the privilege to work with was Donna Fenske, who shared her latest ideas. The premise of this Sewing With Nancy program is to use a variety of fabric strips to achieve designs that have great visual interest. Strip by Strip Patchwork Quilts is a two-part series on Sewing With Nancy. Horizons is the first featured quilt design. It gives the sense of the colors of the sky either at sunrise or sunset. In part one of Strip by Strip Patchwork Quilts, Donna shares how to create strip-sets making this quilt a snap. Watch episode here. Choose a variety of batik fabrics with one striking background color and you’re ready to create Donna’s next quilt design, Diamond Spectrum. On this Sewing With Nancy series, you’ll learn how to make a fabric tube from strips of fabric, then creatively cut it into blocks. It’s an impressive design! Many fabrics cut to the same size are all that you’ll need to create our next project, Sunset Streams. Even though simplicity is the key to the process, the final result packs a lot of wow factor. 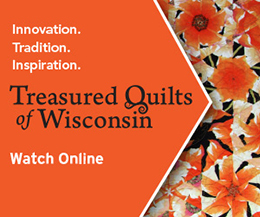 Next, learn Donna’s modern quilt-making techniques on Strip by Strip Patchwork Quilts. Discover how fabric and dimension changes within a pattern can produce a quilt with an entirely new look. Watch Strip by Strip Patchwork Quilts (Part One) on Sewing With Nancy online. For a chance to win a copy of the new Strip by Strip Patchwork Quilts DVD, from Nancy’s Notions, please leave a comment sharing your favorite time of day to sew or quilt. Darling idea with beautiful prints such as yours, besides being able to make matching aprons, pot holders and accessories! They’re much prettier than the crocheted versions I’ve seen. Be sure to check out the 2018 Modern Mini Quilt Challenge! I would like to purchase the book and video set, Strip by Strip Patchwork, however i don’t seem to be able to do that on your website. Please advise me. I recently changed my art practice so that I am sewing in the afternoon. I’m a lot more relaxed after painting and doing Mixed Media work in the morning. In the morning. Thanks for a chance to win. Would love to try making strip quilt! My favorite time is after my “chores” are done so I can really focus on the quilting. Sometimes that’s early morning, sometimes not until 7 or 8 at night. My favorite time to sew is whenever the mood strikes me & hopefully it’s a bright sunny day. Hi, there is an error in the written instructions for the Diamond Spectrum Quilt. The instructions say to create two 20-strip strata, when in fact only ONE strata is needed, cut into nine sections, and then sewn onto the 4 1/2” wide fabric A strips (of which nine are called for). Is there an edit somewhere to the instructions, and are the other patterns correct as written? Thank you! I like to quilt after lunch. It’s my time. My favorite time to sew would be in the morning. However, I rarely get to sewing until the afternoon! my favorite time to sew is any time I get the opportunity! Life always seems to be so busy, so I grab whatever time I have and try to just enjoy it and not be too cranky when I have to leave my project and go back to whatever else is calling me. My favorite time to sew is evenings. The house is quiet and it relaxes me before going to bed. Unless of course, I can’t make myself stop sewing and sew til early morning. Thanks for a great giveaway! I saw this on your Sewing With Nancy Program today on WTGE. Love it! My favorite time to sew is in the mornings or evenings this time of year because of how hot the temp. gets, it’s been in the 90′s for the last month or two and that drains my energy a bit. I love to sew anytime I get a chance and am not too tired from work. I love to sew at any time of day that I can find the time. With that said, I think I usually end up sewing in the afternoon to evening. Once all the “have-to’s” of the day are done, it’s nice to relax at the sewing machine. I’m not much of a morning person so I quilt in the afternoon. In the morning, when everyone is gone and I’m alone. My favorite time of day to sew is in the afternoon, my chores are completed by then and I can sew without guilt until the school bus comes with my grandchild! Now that I am retired, I love sewing early afternoon when the light is the best in the room where I sew. I like sewing in at night after work, or during the morning on the weekends. I guess that means just whenever I have the opportunity! I enjoy sewing during the evening, when I can relax and sew away the worries of the day, and recharge my soul. First thing in the morning. Create juices flowing with the coffee. I’m optimistic about the day and it shows in my work. I prefer to sew in the daytime when there is lots of daylight. That is the best time for me. I love to quilt in the morning . My time to relax and kind of live in my own world. Sewing is my passion. To me connecting pieces of fabric together to form a subject is my creativity to give to others is my way of sharing my thoughts of beauty. I love to quilt any time of day but it’s particularly “pieceful” to quilt after my husband retires for the night. Mid morning after first cup of coffee before I start my mental “to-do” list. Only when I put sewing first can I push aside other distractions. I prefer to sew in the morning, but when I’m wide awake and can’t sleep sewing is a very relaxing activity that soothes me. I love to sew ANY time of the day. I always seem to get derailed in the mornings, but manage to sew a few hours in the afternoon. It’s usually when inspiration strikes. But I’m definitely a late night quilter lately. It’s the most peaceful time with no distractions. Mornings are my most creative time. When my children were young, it was my only ‘me’time. Even though they now have children of their own, mornings have remained my quiet time and now I spend them sewing. I usually sew in the evening after the kitchen is cleaned after supper. I find it a very relaxing way to unwind before going to bed. I enjoy quilting in the morning when the natural light is best in my sewing room. It is a very relaxing way to start the day. Living in SoCal offers too many morning temptations to be outdoors. I sew mostly in the late afternoon until midnight. But I do kit up blocks for hand sewing if the day includes long waits for an appointment. I sew early morning to afternoon with nice natural light shinning in the window. my hubby takes me out to eat those days. It can’t get any better than that, but I also sew other days if I have something I need to get done. I can sew anytime day or evening, but I prefer mornings. I have two sewing machines and usually have projects going on both of them. Since retiring, during the winter, I quilt all day long. Never felt better in my life, as when I am at the sewing machine. During the summer, it is early in the morning, right after breakfast for an hour. Than we are outside until around 6 pm. Than after dinner for an hour of quilting. I like to sew early in the day when I can, but it is often evening before I sit down at my machine. I try to sew and practice the art of quilting at night before bed. I am sole caregiver for my 90 year old mom and sewing directs my attention away from the daily tasks. I love seeing flat pieces of fabric become lovely useable works of art! Anytime I can scrape more than an hour together , I’ll try to spend it quilting. Bonus if it’s during the daylight hours and the weather is nice so the dogs can entertain themselves running in and out of the house. I prefer sewing from lunch to supper prep time (about noon to 4-ish). House is cleaned up and errands have been run, so it’s my time! I like quilting usually in the evening. I am more creative in early am but often sew into the night and early am. What , just one more block, oh no, it is 2pm! Of coarse I am retired. I prefer to sew in the afternoon to take advantage of the sun light coming through my sewing room windows, but evenings work well for me, too… thank you for the opportunity to win this DVD, I love strip piecing. My favorite time of day to quilt is any time I can get time. It usually comes in the afternoon and evening for me. I love sewing first thing in the morning. My mind is uncluttered with daily goings on and I am open to creativity. Sewing in the morning brings a calmness to start my day. My favorite time to quilt is late at night when the house is quiet. The kids and my husband, as well as the animals are all asleep which let’s me focus. Now my favorite time to sew is early afternoon when priorities have been taken care of and I can concentrate on my fun sewing projects. When my daughters were growing up, late at night had to be my favorite time since it was the only free time that I had. How life changes!!! But my sewing sure does help fill my time now!! I love it. Thanks for so much inspiration!!! I prefer to start sewing in the afternoon. I am more alert then, and can pay more attention to accurate cutting & piecing, seam allowances, and pressing. Hand sewing, however, I like to do at night. I can sit comfortably with my Org light and make great progress. Sometimes I will attach the back of a binding like this. My favorite time to sew/quilt is during the uninterrupted hours when my hubby is at work (and children were at school when they were still at home). A hot cup of tea/coffee, some good music, and sewing/quilting bliss….Many outfits for him, myself, our boys, nieces, grandsons, church choir, etc and many quilts, especially for gifts, have been made during these moments of repose for me. I like to sew in the afternoon, evening and late night!!! Night Owl!! Hoot Hoot! I love to sew in the afternoons before and after dinner when things are quieter and chores/errands are done. I quilt in the morning and sometimes the afternoon. 2 days a week I go to quilt guilds. Sometimes I will do hand sewing in the evening while watching tv. Afternoon works well on days I don’t go to a guild. I have been having health problems since Christmas but am slowly getting better so have to pace myself. I’m working on a Scrambled Nine Patch and like to sew mid-morning and early afternoon before I get too tired. My favorite time to sew and quilt is ” all day, every day” !!!!!!!!!! My favorite time to quilt and sew is mornings, but if the weather is nasty, I will be in my sewing room all day. If I have hand work, that I will do in the evenings after dinner. I love to quilt anytime of day . Whenever I have a free moment; I escape to my sewing room . I just love to sew in the morning in the dining room, overlooking the lake at our cottage. In the evening, I do hand sewing on the comfy couch. Evening while I am still working, but after I retire on 8/1, anytime will be the best time for quilting. Any time between 8:00 am and 10:00 pm is good, though I usually sew in the evening after dinner. My favorite time of day would be any morning or midday. I just cannot get motivated to craft in the evenings. My favorite time of day to see is in the morning when everyone has gone for the day.No interruptions just me and the sewing machine.It’s like heaven. The earlier the better before the demands of the day get in the way. But any time I can is a good time! Although I enjoy sewing & quilting any time of day, I do my best work in the afternoon, especially if I used part of the morning to walk my beagle, thus helping to ensure a good afternoon nap for him. Evenings, after another beagle-walk, are better for knitting/crocheting or occasional sewing hand-work. Thanks for the continued great inspiration. Since sewing time is limited, any time that I can get is a good time, unless I am working on something black then only during daylight hours. Sewing is pure joy. Strip sewing is fun and fruitful! I have more energy in the morning so I often do my best work then. But the evening is good for relaxing hand sewing. I love to sew all day anyday. Bright sunny days are best, but gloomy days go unnoticed while in my sewing area. I like to quilt morning, noon, and night. Anytime I have time is a good time to quilt. I like to sew in late morning or afternoon! I love to sew in the evening…I am a “night” person and love to create when I am most alert. My favorite time to sew is whenever I can . I sew anytime of the day. I’m usually up until 11:30. My favorite time of the day to sew is early in the morning when the birds are singing and everything is new and full of potential. This time of day seems to inspire me the most. During the day after my workout (otherwise I would not get it done! ), until either my husband is absolutely starving to death or my back says it’s time to stop. Evenings are reserved for time with my husband. I like to sew any time of the day or night, but the best time for me is mid morning to mid afternoon. Much later than that and I tend to make more mistakes and the seam ripper gets a workout. I love to sew anytime I can but my most favorite time is when the sun is high and lighting my sewing room with its bright rays. I usually try to get some quilting time when my husband, who has dementia, is sleeping or at his day out program. I wish I could sew all day long! However, the morning or mid-day seems to be my most creative time of the day. Once I get started, I just don’t want to quit – but the family likes to eat occasionally!! I love to sew first thing in the morning, while it’s quiet and noone else is up. I can peer out my window and watch for any urban wildlife. Such a delight. I love to sew anytime of day. There’s just not enough hours in the day! My favorite time to sew is anytime I have 10 or 15 minutes to sew a few seams. I like to have several projects going at any time so if I have a larger block of time, I can work on a larger project. My favorite time to sew is during the day when the sun is beaming into the sewing room. I am a daytime quilter and I slow down in the late afternoon to nothing in the evening. I like to sew any time of day and now that I’m retired I can do that! Love these patterns! Favorite time – after lunchtime – especially here in South Mississippi, in Summer, at the time of the most very hot day! My best sewing/quilting time is to begin in the afternoon after a nap. That’s when I seem to have the most energy. Best time to sew is anytime you can get to the sewing machine. There are many distractions so just take care of them and get back to what you like. Mornings are best – I am chipper and alert. But if that fails, and it often does, then next best is after dinner and into the night. It gets me going and keeps me energized. I love to start my day by sewing. If that doesn’t work, I tend to rush through my household chores, so I can get started. My favorite time is as soon I can sit down to my machine! As a novice quilter, I get so excited to see my projects coming together I don’t even look at a clock! I prefer late afternoon or evening after everything else is done. Then I can relax with either my sewing or yarnwork. Unless there’s a zipper involved….then it’s whenever I work up the courage to tackle it! Sewing is my passion. I sew any time I’m awake..most everyday. Quilting came to me at a later time in my life and I only wish I had found it earlier. I started sewing at the age of 10 s so I could have clothes for school. Back then material wasn’t as expensive as today so it was much more economical for us poor folk. I sew in spurts! There are days I don’t sew at all. Then there are days and nights I sew constantly! I like the idea of sewing in the mornings. However, I love coffee and it gets cold while I sew. So, Coffee comes first while I watch sewing/quilting shows. When the pots gone I am totally energized and ready to tackle any project! Some nights I just can’t sleep – going to my sewing room is calming – and helps me to relax – therefore able to go back to sleep. I get some of my best work done at this time. I like sewing in daylight…so anytime from sun up to sundown! In the early morning is the best time for me. I enjoy having a whole day to sew/quilt. My favorite time is any time I find the time — morning, noon or night. I love to sew, but I enjoy sewing only when I’m really in the mood. Whether it be at the drop of a hat or when I have a deadline. I need something to motivate me to get in there. Otherwise, it seems to turn out badly. Ripping out seams and getting frustrated is not my idea of enjoyment, and that’s what happens when I’m not really in the mood. I feel that it is a creative process even when you have instructions and a pattern. Any time I can find a few minutes to sew. I enjoy sewing in the morning. It is a relaxing, creative way to start my day. My favorite time of to sew is Sunday evening after the dishes are done and everybody is settling down for the evening and getting ready for the week to come. Any time is a good time to sew or quilt. I would say my favorite time is morning and early afternoon. Since I am a morning person, I have more energy. However, if the mood strikes. ..evening works well to relieve stress. Anytime!!! Sorry that there are only 24 hours in a day. The first few hours in the morning.